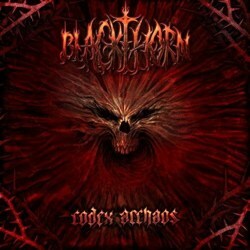 Blackthorn is a very interesting band from Russia. They belong in the gothic metal genre, with many symphonic black metal elements in their music. What is special about them is that all their five members are female. They were formed in 2004 by Aina, their lead vocalist and in 2007 they released the demo “The Prologue of Eschaton”. In 2009 Blackthorn released their debut album “Gossamer Witchcraft” with the English label Ravenheart Music, as well as its twin version with Russian lyrics entitled “Araneum” via Musica Production. In the end of 2011 they released their second full-length “Codex Archaos” this time through MSR Productions. Judging by their quality production and special album package, it’s obvious we have to deal with a very professional band! Their sound is excellent and the improvement compared to their first work is huge. Blackthorn play extreme gothic metal, combining melodic and rhythmic guitar riffs with classical instruments (Elvira’s grand piano and Less’ violin). The fast tempo of their music and the use of many synths results in a majestic symphonic album. Aina’s operatic vocals are flawless and her voice is really beautiful, one of the best in this genre in my opinion, much better than the debut. The combination, or contradiction, with female black metal screams (by Aina and Elvira) works perfectly and make “Codex Archaos” even more interesting! They also use dark choral vocals, giving a creepy obscure atmosphere in their music. There are totally 12 songs in the album (including an instrumental intro and outro) and it lasts for about 44 minutes. Their composition skills are at a high level, with countless melodies and original ideas. All songs are great, but if I had to pick one song from the album that would be “Emptysis Kiss”, whose dialogue between operatic vocals and black metal screams has stuck in my head. This time most of their lyrics are in English, except for the song “Серебряный Kлюч” which is in Russian and some German and Latin parts in two other songs. Blackthorn really deserve the attention of lovers of extreme gothic symphonic dark metal. These five girls worked hard to reach to larger audience and since their music is great, I think it’s now only a matter of distribution and advertising. “Codex Archaos” is released by MSR Productions in a deluxe digibook edition with 20-page booklet that really worths your money. You can visit their facebook and myspace pages to listen to some of their songs.